Travelade is a small startup on a journey to make travel more personal. We're a group of avid world travelers, and have come to realize that everyone's travel style is different - and changes. Too often recommendations of what to do and see at a destination don't take into account you and your preferences. So whether you're a wilderness lover looking to stay clear of crowds, a backpacker on a budget, or a family seeking kid-friendly fun, we want to get you the right â€” and trusted â€” recommendations. Vacation time is too short to be wasted on disappointing experiences! Every journey has a start, and ours is in Iceland, homeland to a couple of us on the team. Weâ€™ll help you find the right path (or glacier, or museum) that suits you, and will be expanding to more countries. Are you planning a trip to Iceland? 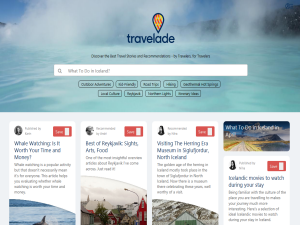 Travelade Iceland has everything you need, from great blog posts, travel stories, videos and the best selection of tours available for Iceland. This what your Travelade - Your Local Friend in Every Place Blog Ad will look like to visitors! Of course you will want to use keywords and ad targeting to get the most out of your ad campaign! So purchase an ad space today before there all gone! If you are the owner of Travelade - Your Local Friend in Every Place, or someone who enjoys this blog why not upgrade it to a Featured Listing or Permanent Listing?